InM is going to undertake a longitudinal study on “Promoting Micro Enterprises through Microcredit”. 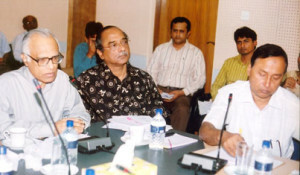 With this project in mind, InM organised a workshop titled “Pre Study Workshop on the Growth and Development of Micro Enterprises in Bangladesh” at 10.00 a.m. on the 3rd July 2008 in PKSF conference room. The objectives of the workshop were (і) to exchange ideas and discuss broad range of issues with the MFIs and policymakers concerning micro enterprises and (ii) to identify the basic problems and prospects of the enterprises in Bangladesh based on the success and failure cases of such enterprises of different institutions. Dr. Wahiduddin Mahmud, Chairman of InM chaired the workshop, while Dr. Mahabub Hossain, Executive Director of BRAC and Dr. Quazi Mesbahuddin Ahmed, Managing Director of Palli Karma-Sahayak Foundation (PKSF) gave their valuable comments at the workshop. Professor M.A. Baqui Khalily, Executive Director, InM welcomed the participants and presenters. Chrysanthi Hatzimasoura, an international intern at InM presented her paper on “Research Issues and Global Experience of Micro Enterprise” based on literature review. During the session there were 15 presentations by the MFIs depicting the success and failure stories of their clients in the Micro Enterprise sector.